It’s rare to see Stephen Curry lose his cool, but he hit his breaking point after fouling out in the fourth quarter of Game 6 of the NBA Finals. With the Cleveland Cavaliers blowing out the Golden State Warriors en route to tying the series at 3-3, Curry picked up his sixth foul while trying to make a steal on LeBron James. There was little contact, and Curry, frustrated, flipped out and whipped his mouthguard into the stands, hitting a fan. He then screamed at the referee in anger. 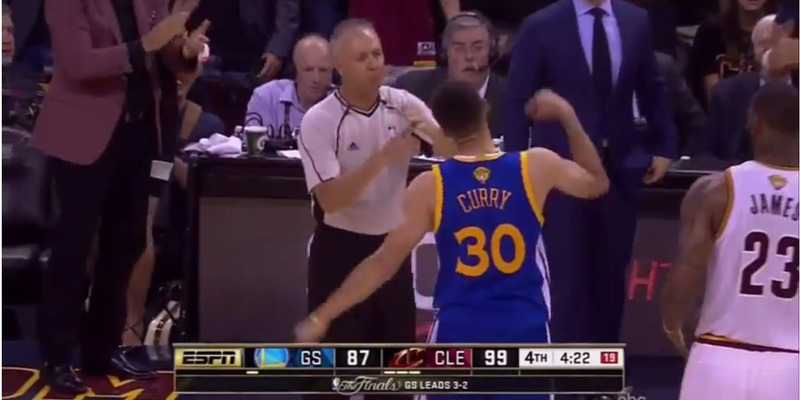 Here’s a slow-motion, close-up of Curry’s mouthguard hitting a fan. He later shook their hands before exiting the court. It capped off a frustrating night for Curry and the Warriors, who failed to close out the Cavaliers for the second game in a row. Though Curry posted 30 points, he once again struggled defending Kyrie Irving, was sloppy with the ball, and committed several foolish fouls. The series goes back to Oakland for a seventh and final game, and the Warriors are going to need their MVP to regain form.